Kieva Clegg and Rico Bringeman with coach Ian Wells. 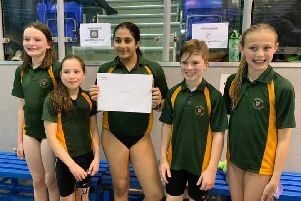 Boston Amateur Swimming Club won the Top Club award at Sudbury over the weekend. Kieva Clegg claimed five personal best times, one of many team members to beat previous records. Other highlights included Joseph Vickers swimming a sub-five minute 400 individual medley and Reggie Giggs earning his first Midland times.